Women in Stone in Germany, a GREAT Success! Tennessee Marble Company owner and President, Monica Gawet’s, recent trip to Germany was a great benefit on many fronts. Empowerment, exposure, and connections were just some of the positive outcomes for the participants. Women are a growing force who are bringing fresh perspectives and a new style of leadership, challenging the norms that have been guiding the natural stone stone industry since the earliest civilizations began cultivating and building with stone. 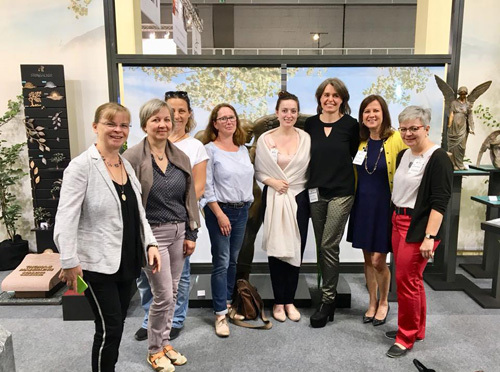 Representatives from Women in Stone, of the Natural Stone Institute, and Meisterfrauen, the German counterpart, met to discuss challenges facing women in the stone industry and develop solutions and strategies to work together to overcome these obstacles they are encountering. Stone World Magazine has the full story here.